VETERAN Rain or Shine bruiser Ryan Arana ended up at San Miguel Beer under the terms of a three-team deal also involving Barako Bull that was approved by the PBA Commissioner's Office on Thursday. As Spin.ph reported on Wednesday, Rain or Shine decided to send away one of its longest-staying players in exchange for a Barako second-round pick in the 2016 rookie draft but was unlikely to stay at the Energy camp. 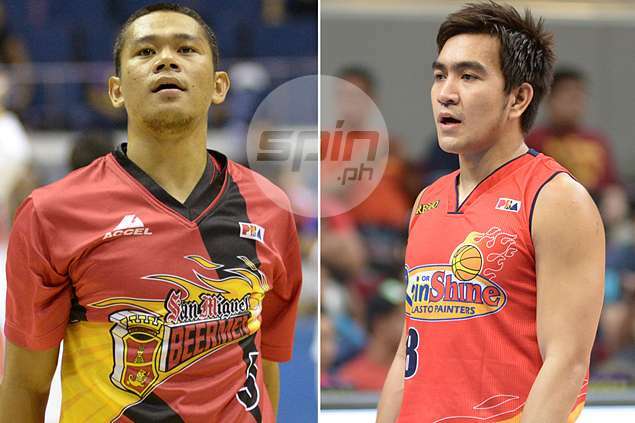 True enough, the deal took on another form when it was finally completed, with the veteran Arana ending up at San Miguel Beer in exchange for rarely used gunner Ronald Pascual. Arana, who was drafted by Rain or Shine (formerly Welcoat in 2007), will now add much-needed toughness to a San Miguel defense alongside fellow bruiser Ronald Tubid. On the other hand, Pascual was picked No. 3 by the Beermen in the 2014 rookie draft just behind Stanley Pringle and Kevin Alas but never got much exposure in the talent-laden team. After a forgettable debut season, the former San Sebastian Stag is expected to more playing time at Barako - ironically the original owner of the first-round pick which the Beermen used to pick him. Pascual is set to become the 13th player in Barako's current pool who had previously played for an SMC-owned team.